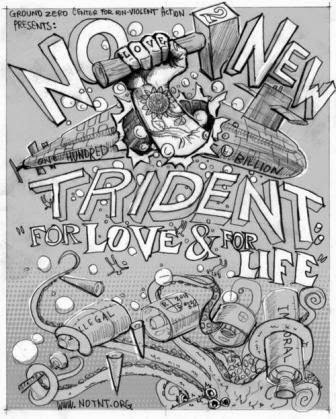 NO To NEW TRIDENT - For LOVE & For LIFE: Activists Make Statement at Nuke Base: Our Children Deserve Better! Activists briefly blockaded the entrance to a West Coast nuclear weapons base in a statement against U.S. Nuclear modernization efforts on the eve of Mothers Day. On Saturday, April 9, 2015 anti-nuclear weapons activists gathered at the main entrance gate to Naval Base Kitsap-Bangor, Silverdale, Washington, home to eight of the nation's fourteen OHIO Class (Trident) ballistic missile submarines. Carrying signs saying “Our children deserve better”, five protesters walked into the roadway and blocked traffic entering the base. Washington State Patrol officers moved in and escorted the protesters off the roadway. Anthony DeLorenzo, Seattle, WA; Tom Karlin, Tacoma, WA; Mona Lee, Seattle, WA; Brenda McMillan, Port Townsend, WA; and Alice Zillah, Olympia, WA were cited for being in the roadway illegally, released and escorted back to the designated protest zone where others were protesting. Other activists on the overpass over the entrance road held a large banner that read: "Abolish Nuclear Weapons." The Mothers Day eve protest and nonviolent direct action was an annual event held by Ground Zero Center for Nonviolent Action at the Bangor Trident base. This year's event was held at a time when the U.S. Government continues to modernize its nuclear weapons, their delivery systems and the infrastructure that builds and maintains them at a cost estimated at roughly a trillion dollars over the next three decades. At the same time nations are meeting at the Nuclear Non-Proliferation Treaty (NPT) Review Conference in New York. 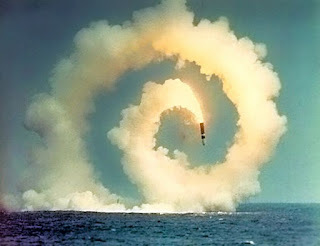 Ground Zero Center calls on the U.S. government to change course on Trident and its overall nuclear posture, and begin to live up to its obligations as a member of the United Nations and as a signatory to the NPT. Anything less is a theft of our children's future. The Trident submarine base at Bangor, just 20 miles from Seattle, contains the largest concentration of operational nuclear weapons in the US arsenal. Each of the 8 Trident submarines at Bangor carries up to 24 Trident II (D-5) missiles, each capable of being armed with as many as 8 independently targetable thermonuclear warheads. Each nuclear warhead has an explosive force of between 100 and 475 kilotons (up to 30 times the force of the Hiroshima bomb). It has been estimated that by the time the new generation of ballistic missile submarines are put into service, they will represent 70 percent of the nation's deployed nuclear warheads. Ground Zero Center for Nonviolent Action is currently engaged in legal actions in Federal court to halt the Navy’s construction of an unnecessary Second Explosives Handling Wharf at Bangor. Ground Zero's NO To NEW TRIDENT Campaign (notnt.org) is working with other organizations to de-fund the Navy’s plans for the next generation ballistic missile submarine, also known as the OHIO Class Replacement or SSBN(X). For over thirty-seven years Ground Zero has engaged in education, training in nonviolence, community building, resistance against Trident, and action toward a world without nuclear weapons.